Later, I got an idea off Pinterest of a ROLLING CHUCK BOX. I loved the idea and couldn’t get it out of my mind. For me, I didn’t want a chuck box to house my eating utensils or paperware or even cookware. I wanted a box that has most everything I’d need to make meals while camping. I’d keep my Dutch oven or any pots and pans in another bin since they’d take up most of the space. I found this on Amazon for $77. Click image to go to Amazon link. So here is what I came up with! Our Rolling Chuck Box. I used the Stanley 4-in-1 Mobile Work Station Tool Box. After looking at several other options, I chose this one, mainly because I liked the stadium layout where I can see all my items at once and get to them as needed. Then I can close it up and roll it where I need to. If it rains, I can roll it into a tent, or under cover. I love that. I began making a list. I knew I wanted knives, a cutting board, and some bowls. I wanted bowls that last longer than plastic, so I got stainless steel bowls. I wanted cooking utensils and ways to start a fire. I continued on until I had my list. Many items I already had, and other items I purchased. I have to admit, my aim is NOT just for camping. I’m also looking at this as an EMERGENCY KITCHEN – CHUCK BOX! I’d love to have a lot of items I’d need in here to make meals in the event of a disaster or even bug out. It’s mobile after all! Hopefully this will help if you are wanting to put together a chuck box as well. Three thermometers. Two are for meat, one for cooler temperatures. Two can openers. These are durable ones. One has a longer handle for opening #10 cans easier. I have to say that QUALITY can openers are a MUST with back ups. I went to girl’s camp last June and was helping with the food. In just the few days we were there, we broke 3 can opener on those #10 cans! Stainless Steel Measuring cups and Spoons. I didn’t want my plastic ones that break easier and where the labels wear off and I can’t even see what measurement it is. Flashlight with Batteries. It gets pretty dark at night when trying to cook sometimes. Pair of Silicone Oven Mitts. Durable and can handle high temps, easy to clean. Pack of Cutting knives with sheaths. I used this kind at girls camp and loved them, so I got some when I got home. Since I’m not using a knife block – the sheaths are important when storing. Six Rubber Spatulas. Two are cheap ones, but four of them are the silicone ones with steel rod inside. Those are my favorite to use. Very durable. Five Bamboo wood utensil set. I’ve broken many a cheap wooden spoon, so I looked around and found a set that I felt would last longer. Bamboo is very durable. Three tongs – one extra-long. These can also be used to move coals around in the fire and on your Dutch oven. Two Peelers. One is double sided with different sized. One is standard. Six wash rags and four kitchen towels. I pre-washed these and then rolled them up with rubber bands on so they fit nicely. Spices in glass jars with screw on lids and shaker holes underneath. Spices include: granulated garlic, chopped onion, ginger, cinnamon, taco seasoning, Italian seasoning, Cajun seasoning, chili powder, rosemary, and dill weed. I found it much cheaper to get these spices in the bulk section of WinCo. I got the glass jars at Bed, Bath and Beyond – they were 99 cents each. Salt and Pepper in containers that close securely that I found at Bed, Bath and Beyond. Two red aprons with pockets. I folded them up and they fit in the pocket just perfectly. Liquid dish soap in a zip lock baggie, sponge in a baggie and steel & copper pads in a baggie. Classic Bamboo Cutting board with removable cutting mats that store inside. Costco used to carry this but when I went to buy it, they were gone. So I found one on Amazon. I really like the different cutting mats that can be used for different food and help protect from cross contamination. Five Stainless Steel mixing bowls with plastic lids. Three of these are matching that I got at Walmart. Three smaller ones I found at WinCo. Silicone Mat. This can be used on a cookie sheet to keep things from sticking; it can be used on a table to set hot dishes on. Lots of great uses. I keep it rolled up with rubber bands on it while it’s stored. Tundra Fire Extinguisher Spray. If something catches fire, I want a quick way to put it out. Vegetable oil spray and a bottle of Olive Oil. I also have an empty plastic squirt bottle to put olive oil in when I do use it for quick use. I didn’t want to put it in until I actually open the olive oil. Box of Dutch oven liners. You can find these on Amazon or at stores like Walmart in the camping section. I can also use parchment paper when those run out. I found those super helpful to use when I was camping! Hand held grater. I got one with different sizes to use. I had to practice how to open the tool box, but once I knew how to open and close it; it was simple enough. You push the locking bar on each side to the unlock position, and then pull up the metal clip in front and slide it out. To close, you pull up the metal clip and slide it closed and then push the locking bar into locked position. There you have it. 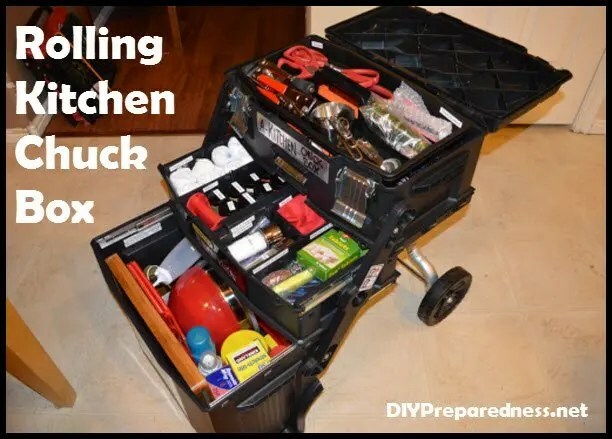 A Camping and Emergency Kitchen Chuck Box. Keep it with your camping gear and/or your 72 hour kits. You know, I almost wanted to get TWO of these rolling boxes and include things like eating utensils, plates, cups, etc. and more items for cooking; but then I figured that I will have those in bins and all this is the main stuff that I need to be mobile. Awesome! I love your list. I have never seen that storing cutting board before. Great idea. I can’t believe you got all that stuff inside!!! Thanks for sharing. Do you think this would work for dutch ovens? I have 2 and a skillet. Would they fit in bottom section if I nested them? Oh, I could buy 3 of these for camping! You know it might work depending on how big your Dutch oven is, but two wouldn’t fit in there. I decided to have a separate bin for my Dutch ovens and other pots/pans. I would love to have two of these rolling boxes to fit more in and have it be easier to roll to where I need it. Margene, Have you found that this would include just about everything you would need if you were camping for a very extended period of time (wink, wink)? I plan to dutch oven cook, use my solar oven (which comes with its own accessories), and I would bring some other pans for my wood stove. So of course the pans wouldn’t fit inside here, but is there anything else you need to bring along you would need or do you find it covers just about everything? Thanks for your great posts!